Thousands of gyms. Total flexibility. The Monthly+ Pass gives you unlimited access to your chosen gym and thousands of others at the same price or less. Work out near your home or your office. So you can smash it at the gym then in a meeting. No contracts, zero sign-up fees, stop and start whenever you like. Choose from three different pay as you go passes. You just want to get fit. But work is hectic. Your diary is stacked. Life gets in the way. It’s just not working out, is it? But what if you could go to any gym? Near your office, your flat or the pub? Even that fancy boutique place or swanky spa? With one membership, no inductions or contracts, and zero sign up fees. That’d work out, wouldn’t it? Gym and swim wherever you want to. Stop and start whenever you like. 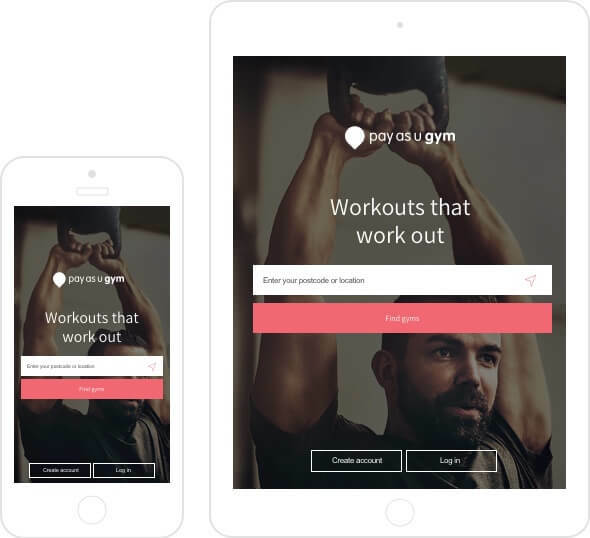 PayAsUGym – the UK’s largest flexible fitness network. We partner with the best gyms in the UK to provide you with the most flexible and best value options to workout. This is a great idea for people who like flexibility in their life and often like to change up their exercise activities and routines. So far, a good experience that has been easy to sign up for and get using. I've been traveling a lot with work and this has been my saving grace for visiting a gym. All the gyms are really simple to interact with the code. I had to get a receipt to get it approved for expenses, I emailed customer services - I had a response in 3 minutes! I used it because I wanted to visit a local fitness club that has a pool and spa facilities once a week. Easy process of paying online for the visits you require and then just showing the reception the code when you arrive. The app makes it very easy to manage your passes. Sign up to be seen by hundreds of thousands of customers looking for their next workout. Find gyms, buy passes and make it easy to find your passes when you get to the gym with our App.